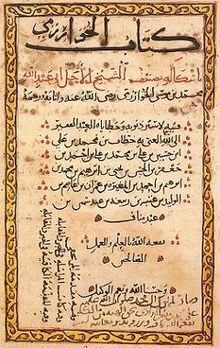 Initially championed by Adelard of Bath, and then later taken up by a series of Toledo based translators and scholars in the 12th century, the Studia Arabum, the Arabic writings of various Islamic scientists and philosophers, were virtually unknown in Mythic Europe before the 13th century apart from Andalusia, the southern Islamic region of Iberia. Outside of small lineages of Andalusian magi, most Hermetic magi had only vague impressions of the Greek science extrapolated and built on in these works throughout much of the early and immediately post-Schism history of the Order of Hermes. This current compilation below was initially envisaged to aid Troupe’s playing in sagas set in Iberia (particularly Andalusia) and the Levant or where a significant proportion of the magi have an interest in the alchemical, astrological, mathematical or philosophical works of these Arab and Persian authors as part of the pursuit of their own magical advancement, but I believe has wider relevance to any Hermetic saga. Each author is provided with a brief historical sketch and their various works are listed with the relevant ArM5 game statistics. Arabic and Persian names are used in preference, although I have tried to provide the Latinized version of the name where possible. Some authors detailed here also appear in Art & Academe — I have concentrated on those scholars with direct links to the Arabic corpus, translators and those European scholars not already detailed whose works draw heavily on “Arabic” sources. Several translations of Greek texts are included due to their significance on early Islamic science and their later value when finally transmitted to the Latin west. Accompanying the author monographs and book statistics are a collection of sidebars detailing and clarifying various rules and issues regarding books in ArM5, suggesting Story Seeds or providing advice about incorporating more books into your saga. Unless otherwise noted, all books detailed here are in Arabic or Persian originally. Some have been translated from Greek with a resultant loss in quality in most cases (see the “Translations” sidebar, Art & Academe, page 87). Reading the text in its original language generally increases its Quality. Some books are better known through their later Latin translations and these cases are noted, as the availability of original works throughout history is subject to chance and accident. Several famous and important translators are detailed to account for this. Know in Arabic as the Bayt al-Hikma, this institute of learning was founded in the early 9th century by the foresighted Abbasid caliph al-Mamun, son of the famous Harun al-Raschid, this early gathering of scholars in Baghdad contributed greatly to the preservation of ancient wisdom and helped lay a sound foundation for later scholars. Originally based on the library established by al-Mansur it evolved into an institute dedicated to the translation of Persian then Greek texts into Arabic and then into a true academy focused on the teaching and development of mathematics, astronomy, medicine, chemistry, zoology and geography. Many of the texts of the studia Arabum translated by the Toledo school have their origins in the efforts of the original House of Wisdom.